Suncherry Extra Sweet is one of the leading cherry tomato varieties. Colorful and sweet, these 15-25g bite-sized, deep red cherry tomatoes can be harvested over a long growing season with steady fruit set. These distinctive, tangy-sweet fruits are best eaten fresh off the vine or in salads and party trays. 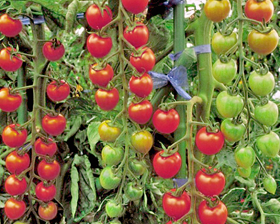 They resist cracking and are particularly disease resistant to fusarium wilt race 1 and TMV.. Height 1,6m.